From bionic eyes to a robot called R2D2, advances in medicine and technology are combining nicely and having a huge impact on the way eye health is delivered and treated. It’s very easy to find over-hyped headlines in the press screaming about how ‘Boffins CURE BLINDNESS’ or ‘The NEW EYE that helps people see again’. All too often, these are reports on work that is so small-scale or early in the pipeline that it will be years – if not decades – before it produces results of any note. And yet not all of it is in fact hype. Around the whole field of sight and vision some startling advances are being made, at a pace that surprises the researchers themselves. It is indeed the case that artificial guidance systems and artificial assistance can supplement – not replace – human expertise in some of the most delicate operations. Robot systems in larger-scale operations are now relatively widespread, and other surgeons are already using the equivalent of GPS systems to enable them to map out and practise exactly how they perform surgery. In September 2015, Professor Robert MacLaren of the University of Oxford used a remotely controlled robot to perform the world’s first eye operation, lifting a membrane 100th of a millimetre thick away from a retina without damaging the underlying tissue. The Robot Retinal Dissection Device (which is known, delightfully, as the R2D2) improves upon the usual operation because it acts like a mechanical hand, without the tiny tremors that even the steadiest human hand experiences – because by definition, a human hand is subject to a pulse. “Normally when we do this operation by hand we touch the retina and there is some haemorrhage,” explains MacLaren. To date, however, doing it by hand has been the only option. “Operating at the back of the eye needs great precision, and the challenge has been to get a robot system to do that through a tiny hole in the wall of the eye without causing damage as it moves around. Most robots in theatre are big, with big engineering whereas this is tiny - everything had to be shrunk down." 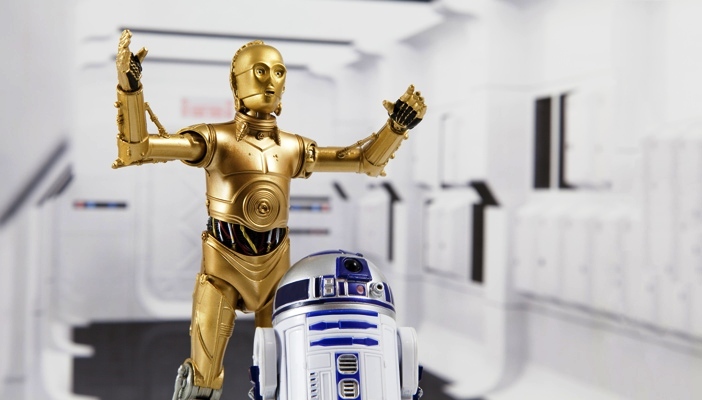 The R2D2 has seven motors, and the surgeon uses a joystick and touchscreen to guide a tiny needle into place with movements as small as 1000th of a millimetre and lifting the membrane away cleanly from the retina it was pulling out of shape (and therefore distorting the patient’s vision). So far, the small R2D2 trial is proving successful in carrying out this operation and restoring vision. The second part of the trial will assess how the robot can place a fine needle under the retina and inject fluid through it, which lead to using it in other trials for retinal gene therapy. In May 2016, a team at the University of Pittsburgh published research into transplanting a whole eye, showing that an animal transplant was still in place – complete with blood flow and ‘structural integrity’ in the eye – two years later. Though, significantly, the team is made up of plastic surgeons rather than ophthalmologists. Does this mean that, as the team hopes, a whole-eye transplant will be feasible in the next decade? Unfortunately, the animals could not actually see because the optic nerves did not recover the ability to transmit visual information to the brain. This is the central issue which makes it unlikely that surgeons will ever be able simply to take a donor eye and graft it onto a recipient. “It’s the equivalent of cutting the spinal cord and expecting it to rejoin and spontaneously regenerate,” says Astrid Limb, Professor of Retinal Stem Cell Biology and Therapeutics at UCL Institute of Ophthalmology. They estimate it will be around five years before a therapy can be implemented in humans. Ever since the 1970s TV series The Six Million Dollar Man, the term ‘bionic’ (which just denotes an electronic and/or mechanical body part) has been used to suggest enhanced and possibly even super powers. Retinal implants (the real ‘bionic eyes’, some of which require wearing a tiny camera and some of which use the eye’s own processing power) are not quite in this league but they’ve been developing an astonishing rate over the past decade. Implants of different kinds have now had significant impacts on the sight of a small number of people with retinitis pigmentosa, replacing the work of damaged photoreceptor cells. Then in 2015 a team in Manchester led by Professor Paulo Stanga fitted the first implant in a patient with dry age-related macular degeneration, and managed to restore some useful vision to the patient. This has enormous potential, since dry AMD is the biggest cause of adult blindness in the UK and does not respond to the anti-vascular epithelial factors used to treat the wet type. “These are early trials, but in time this research may lead to a really useful device for people who lose their central vision,” says Cathy Yelf of the Macular Society. Possibly the most compelling fascination of all is with the idea of growing organs in the laboratory. And now that researchers have identified ways to produce ‘induced pluripotent stem cells’ (iPS cells), which have the potential to develop into different types of cell, there have been some startling developments in this area. In 2011, a team at the RIKEN Centre for Developmental Biology in Kobe, Japan, made a breakthrough with growing an ‘optic cup’, a structure that formed the retina and contains the light-sensitive cells and neurons needed to see properly. At the time, Professor Robin Ali of the Institute of Ophthalmology at University College London (UCL), described it as “absolutely stunning” and Ali’s team at UCL and Moorfields Eye Hospital has subsequently had its own success using the same techniques to grow retinal tissue. Every clinical breakthrough has to go through numerous trials, from the lab to a small group of humans. Many which initially look enormously positive meet with setbacks or founder completely. Yet there are also treatments – like cataract lens replacement – which were once daring breakthroughs and are now absolutely standard. And looking behind the headlines at the solid science, other approaches look set to join them in future.